F#$k. Happened to me a few years ago. Such a painful process. I now have mine in a plastic protector. I shouldn't have to do that, but these things are so weak and cheap that it's a necessity. I feel like I have to bust out my nana's 24k gold plated cigarette case from the 40s and put the new one in it. The company that makes the cards also makes the TD bank cards which are more durable. But TD has billions of dollars so maybe cheap plastic is all us schmucks deserve. But for $6, it should be more reliable. Goddamn it!! French keyboard strikes again!!!! Not if the crack is where the rfid chip is. Renders the card useless. And of course, my card cracked right at the chip. If the integrity of either the chip or the antenna is compromised, the card is toast. The antenna picks up energy from the reader and activates the chip, and the data transfer follows. So, if the card cracks, even partially, from the edge inward, the antenna is severed, and the card is inoperable. For further reading, reference http://bit.ly/1CPzZU0 (How do contactless smart cards work?). Warren, your explanation is bang-on. The antenna in the card is a couple millimetres in from the outer edge, and severing that renders the card useless. People often ask "why can't I punch a hole in my Presto card when my building's ID card has a hole?" Well, old 125 kHz proximity cards generally had circular loop antennas in the lower 2/3rds of the card, meaning one could punch a hole at the top without worry. 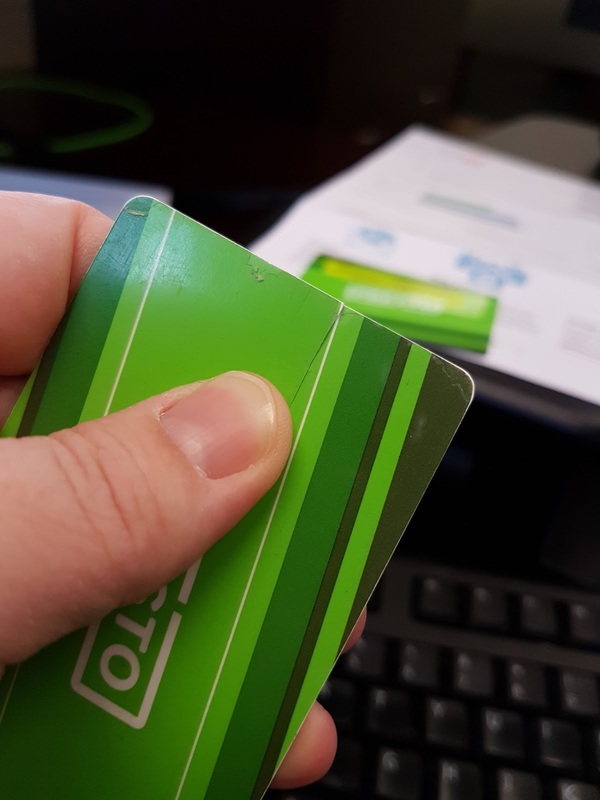 Modern 13.25 MHz contactless cards (including the Presto card) need larger loops to operate effectively. While there are still some varieties that can be punched (HID sells some iCLASS cards that come pre-punched), Presto cards cannot. As an aside, most 13.25 MHz cards (credit cards, iCLASS cards, Presto and other MIFARE cards etc.) use very few wire loops (usually 4) because they can induct more energy from the higher-frequency field. This is why old 125 kHz cards are generally thicker; they need many more windings. That's about as far as my knowledge of antenna design goes -- it's as much of an art as it is a science.